Genus Allium belongs to the family Liliaceae, which contains more than 600 species. Garlic (Allium sativum) and onion (Allium cepa) are two the most popular food ingredients widely used all over the world. During the last few decades, garlic and onion have received tremendous attention for their wide range of therapeutic properties and great health benefits. The variety of garlic and onion species’ considerable differences in manufacturing process cause discrepancies in a spectrum of the ingredients derived. Current garlic preparations available on the market, including garlic powder, garlic oil, raw or cooked garlic and aged garlic extract. Garlic and onion extracts posses many therapeutic properties including antimicrobial, antiviral, antifungal, anti-protozoal, hepatoprotective, cardioprotective, anti-inflammatory, neuroprotective, anti-amnesic, anticarcinogenic, antimutagenic, antiasthmatic, immunomodulatory, hypolipidemic, anti-hypertensive, anti-diabetic and antioxidant. These therapeutic properties are caused by the combination and biological activity of organo-sulphur compounds such as S-allyl-l-cysteine, diallyl disulfide, diallyl trisulfide, ajoene, and allicin. Allicin, which is one of the most researched therapeutic compounds of garlic and onion, is extremely unstable and rapidly degrades with time, even at low temperatures, which causes its prompt degradation during contact with stomach acid during oral consumption. 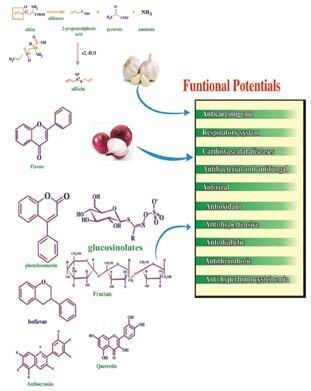 Present review discusses biochemical, pharmacological, therapeutic properties and nutritional value of garlic and onion, their use for prevention disease and maintenance of good health, as well as novel potential nanoparticles drug delivery systems for more effective oral and topical administration of natural organo-sulphur compounds. Allium cepa, Allium sativum, garlic, onion, allicin, organosulfur, flavonoids, sterols. School of Studies in Biotechnology, Jiwaji University, Gwalior 474005, India.